This is my very extra-fancy holiday suit! It is made of velvet and fur and sparkly threads. I like how the white fur trim blends into my neck furs! I'll bet I could wear this outfit to go ice-skating. If I knew how to skate. The best part is the fancy ear muffs that match the suit! These keep my ears warm, but it is a little bit hard to hear. And look! If your ears are not cold, you can use this as a pretty headband. Now I just need some mittens to keep my paws warm! Mittens... or maybe ice skates! That does look like a Sonja Henie outfit! I agree with Sparkle... All you need are pom poms on your skates. but then you're not just a Holiday Princess... YOu're a princess every day! I think I need some of those ear muffs up here in the great white North!! Maybe not in pink though, that suits you better! 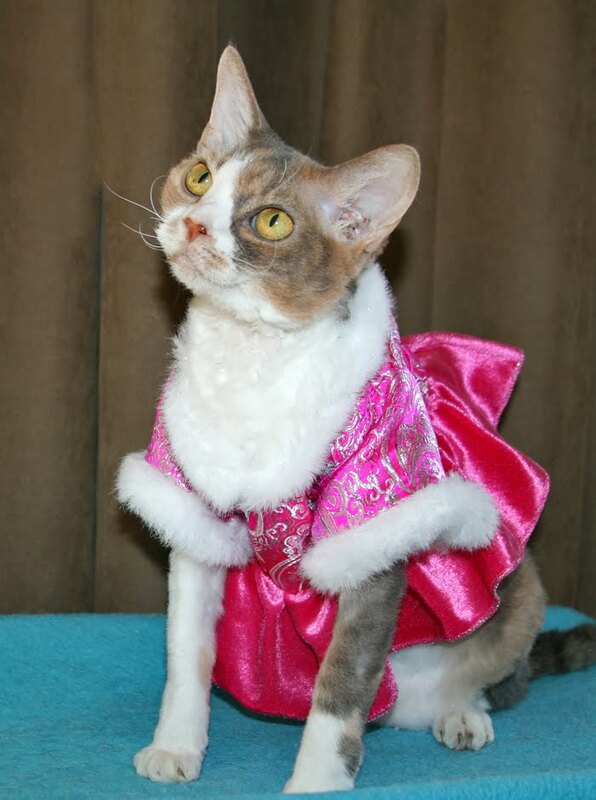 You iz a bewtiful princess I luvs that dress. Iz not sure abowt those ears warmers but it duz look pritty on you Daisy. You have no mittens, Daisy? We have heard of the 3 little kittens who lost their mittens; were you one of them? Never mind, though, you are a pretty princess! You make a pretty princess Daisy. We hope you find your mittens to keep your toesies warm. Oh Daisy, we love your terrific new outfit. Those ear muffs are the greatest but they could just be cheek warmers. Santa needs to get to work on some mittens for those cute little paws. Take care and keep those paws warm. 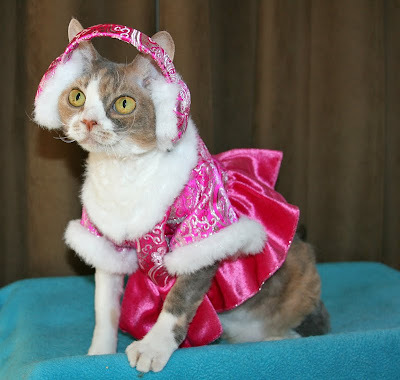 You are so gorgeous in that outfit, Miss Daisy. Wonderful winter princess outfit! You look Qyoot with a capital Q ! honey i think they are "cheek" muffs! you are adorable! We think you're a princess every day, Daisy! You do look like you're ready to skate, with such a lovely outfit. Oh Daisy, you are just adorable! The earmuffs just add that special somethin'. 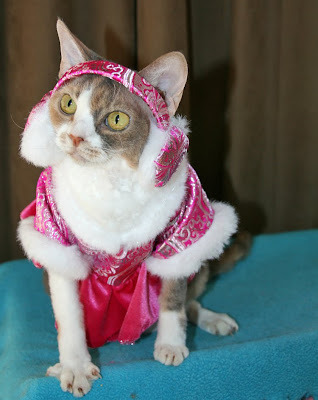 I do not imagine my kitties would be so happy about trying on such a costume, though. your wasting that classic outfit in florida. Daisy, that outfit is adorable...and yeah...we think it makes the purrfect skating outfit! If you had a tiara, you could be a Christmas Princess. Of course, you are the Christmas Princess even without it! I would love to see you skating...I'll bet Harley would like helping with that! Beautiful....we love your Friday Fashion! Gorgeous selection today, Daisy! You look very glamorous! OMC!!! Those ear muffs took me over the edge!!!! HILARIOUS!!!! Oh Daisy, you always find the most fashionable outfits!! You'd need those earmuffs if you lived here in Whisk-onsin. Wow! You are so beeeeeyoutiful in your winter ice skating suit! Very purrty! You look like a snow princess in your pink and white skating outfit Daisy. We think you need pink mittens and pink socks if you want to go skating. You look adorable Daisy! Very festive! I think you will be able to go anywhere in that lovely outfit now! what a beautiful dress!!! you sure are a sweet little ice princess. Daisy, you are the prettiest princess I've ever seen and I love your holiday suit. you definitely would need those if you came to visit me today. Even though it is not reeeellly cold for us yet... it is -16C with a breeze..so feels like -25C... and snowing....so those lovely little 'muffs would be very handy for a little hairless lady like yourself. WoWie! That's the most byootifullest holiday princess owtfit I've ever seen!!!! Maybe if I'm good, Santa will bring me one. Oh my Cod, those ear muffs are too cute, Daisy. You look wonderful. You could be on Skating with the Stars! Daisy, you are a vision in your Holiday Princess suit! We think your pink diamond necklace would go well with that outfit. And don't you have some pink bunny slippers? (You remember, the ones that you were very suspicious of!) We think they would complete the emsemble. Whoa, Miss Daisy, that is a VERY fancy princess dress! We think that if you ever learned to ice skate, that is DEFINITELY the outfit to wear! Wow, Daisy!! You look so beautiful!! What a glamorous dress..and I love your earmuffs too!! Maybe you will get some kitten mittens for Christmas? Oh Daisy! You look absolutely smashing in that outfit!!! Absolutely stunning, Daisy! 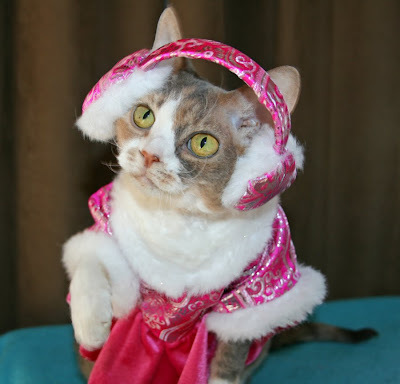 That colour really becomes you -- and those ear muffs are the icing on your furry cake. That's a beautiful outfit, Daisy! Daisy, you look beautiful! Like a princess in a movie. Daisy you make a lovely princess. That is so cute, the ear muffs are adorable. I bet you would make a wonderful ice skater, I can see you know twirling around on the ice. Oh Daisy you are so lovely!!!!!! Yes...pink looks fabulous on you too!!! Daisy, you are a very beautiful Holiday Princess! You are stunning in that Princess outfit. I think Harry wants to ask you to go ice skating with him. That is a very pretty Holiday Dress. That is a very glamourous outfit! We bet you'd be the most beautiful ice skater ever. Daisy, you are a true princess!!! We are in awe ... we ManCats love u! Daisy, yoo look VERY beautiful. Daisy, you look like a princess in that outfit! Love love love the ear muffs. You are a trend setter! Wow, Daisy, you look stunning in the dress! Such a beautiful girl! Dennis says MEWOW WOW WOW WOW WOWEEEEEE MEWOW! OMC! Earmuffs! Daisy, you look like a beautiful Snow Queen. This is one of your most gorgeous outfits yet, Daisy! I love the ear muffs -- perfect finishing touch! You are such a star Daisy - I'd keep off the ice though, makes your bum cold! You look just beautiful, Daisy! And the ear muffs are purrfect! What a beautiful skating outfit. You take the gold. And you are the most beautiful Holiday Princess I have ever seen! So very pretty! And would you look at those lovely kitty claws!! You remind me of a very pretty strawberry! yes yoo iz and also a grate model.